On Sunday, we opened up our doors to some very special guests. We haven’t seen them in about a year or so and it was a great thrill to be in their company again. They happen to be the parents of my friend Tammi who graced me with her presence last week. Her parents are vacationing near Vail and so she concocted a plan to visit us both in one trip. Worked out brilliantly I think. Aunt Carole and Uncle Art are wonderfully, smashing people and I always enjoy our visits. Three years ago, my husband and I went to Las Vegas for his company trip and Aunt Carole and Uncle Art carted us around one evening to various touristy spots (they live in Las Vegas) and were very patient with us as we acted like blithering idiots at the amazement of it all. I always make sure they come over for a bite to eat at my house whenever they visit. They are like having a favourite uncle and aunt and they are genuinely sweet to my whole family. We always have a good giggle when they come. On Sunday, I threw together a Turkish/Greek themed lunch. I did not make a huge assortment of dishes because the leftovers are brutal otherwise. There are only so many days the children and hubby will eat the same dish! On the menu was a moussaka, the potato-cheese pie and a Greek salad. Dessert was treacle pudding, not very Greek, but my friend finds it quite indulgent so I made it for her. Found out later that Uncle Art enjoyed it quite a bit too and of course, my husband. That’s the only leftover he is willing to devour quite readily. 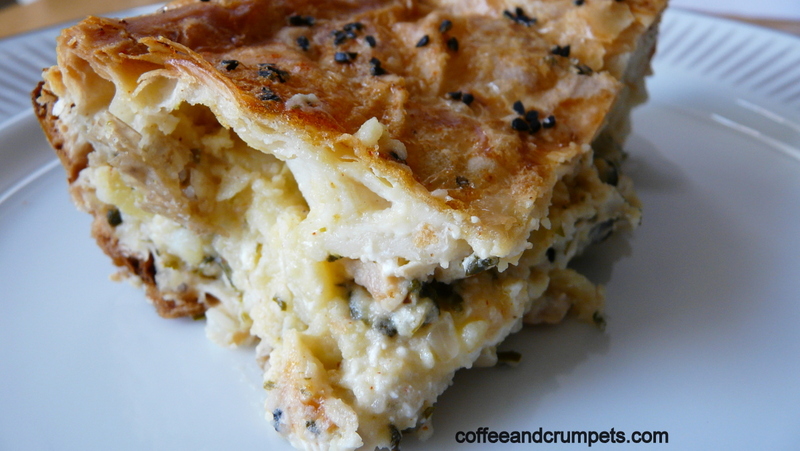 The potato-cheese pie is a dish inspired by the spinach cheese pies from Greece and the potato/cheese boreks from Turkey and Bosnia. 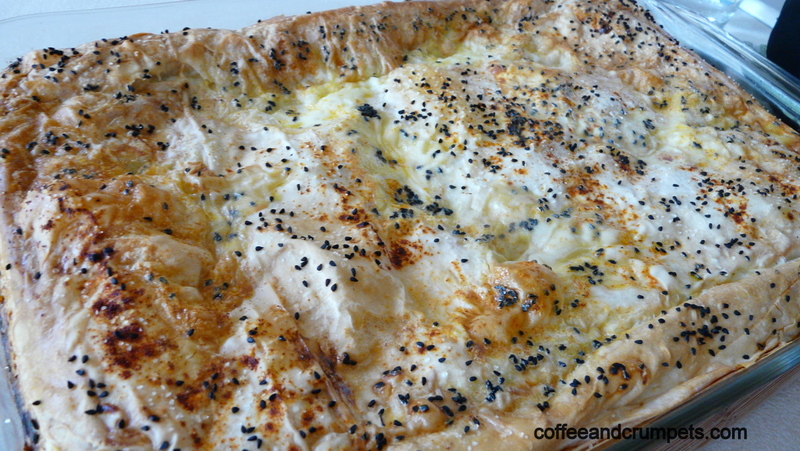 First time I made a spinach and cheese borek pie, I used a recipe that I found after scouring the internet. That was a while back when I was a cheese pie novice. Since then, I have become an old hand at this pie making stuff and now, readily improvise the fillings and such. Sunday’s pie turned out a treat and I know because by the evening, even the crumbs had been licked clean. I do have to mention, because I cannot talk about boreks and not mention her, my friend Meli. She is Albanian/Bosnian and I am quite certain, without a shadow of a doubt that she makes the best boreks (not to mention a bombshell of a checkerboard cake) in the United States. It’s her handmade phyllo dough; that’s the secret to her insanely delicious boreks and of course, all the love she puts into it too. I miss you Meli and I miss your boreks too, especially with Ramadan coming up. 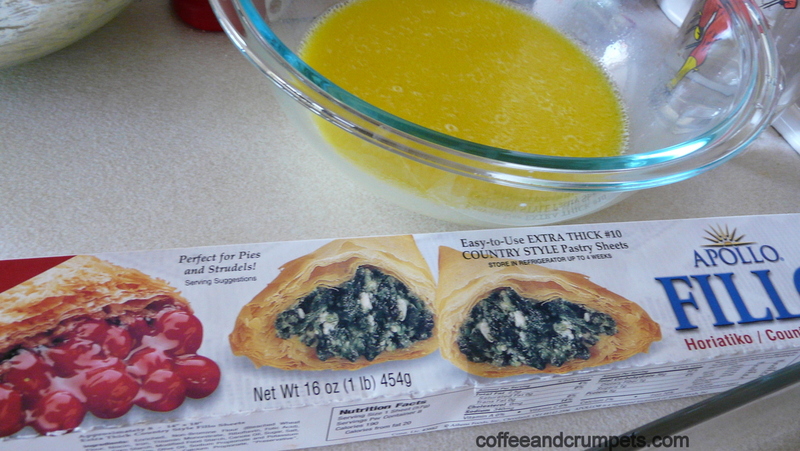 I have not mustered up enough energy or courage to attempt making phyllo at home. I know if I did, the pie would be elevated to the highest echelon of pie ranks. Maybe one day. For now, like the phyllo plebeian I am, I use a thick or country style phyllo which is WAY easier to use than that horrible, brittle, dry thin stuff. That thin phyllo is just infuriating and I get incredibly frustrated when I have to deal with it. 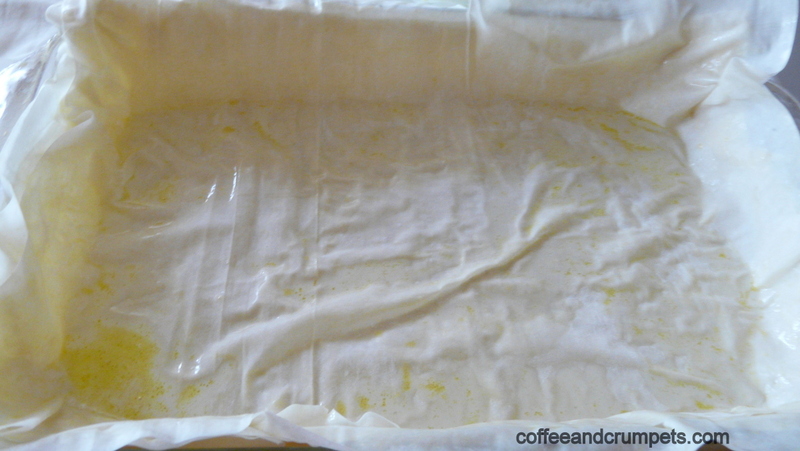 The thicker phyllo sheets are really easy to handle and they don’t dry out as quickly. Look for them at an Middle Eastern or European specialty store. Preheat oven to 375 deg F or 190 deg C.
In a bowl, put the eggs, oil and milk and whisk till blended, put aside. 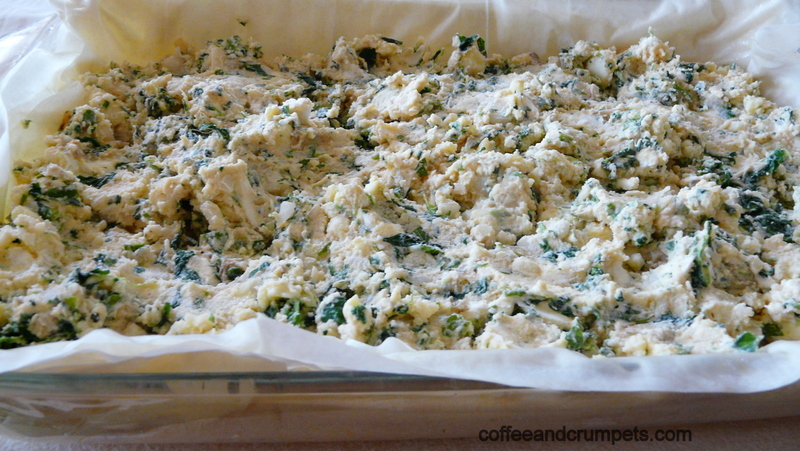 Mix the potatoes, cream cheese, onions, parsley, garlic and spinach, if using. Check the filling for salt and pepper and adjust accordingly. Grease the pan with some of the olive oil-milk-egg mixture. Unwrap the phyllo dough and unroll carefully. Take one sheet and lay in the pan and brush with milk mixture. Repeat this four times, using total of five sheets for the bottom. Scrape the filling into the phyllo, layered pan. Take another phyllo sheet and lay on top of the potato-cheese mixture. 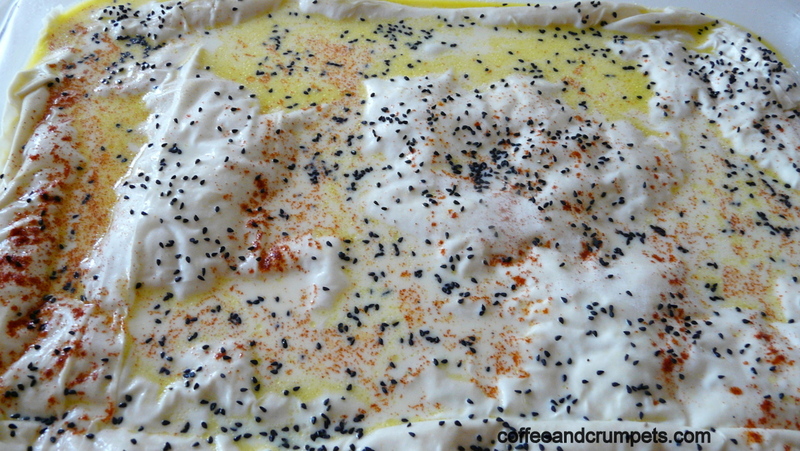 Brush the phyllo sheet with the milk mixture. 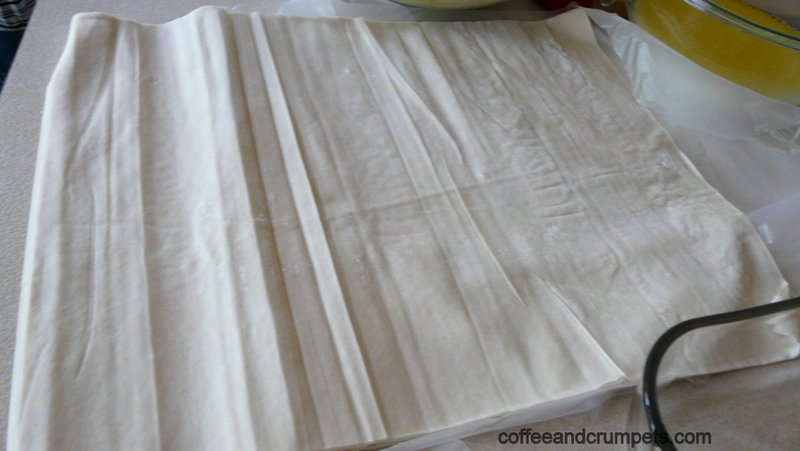 Repeat four times and use up the remainder of phyllo sheets. Pour the remaining milk mixture over the top of the pie. At this point you can refrigerate the pie overnight if needed. milk mixture can get absorbed into the pastry. I prefer to arrange the pie the night before and bake the following day. Sprinkle the top of the pie with nigella seeds. Place the pie into the oven and bake for about an hour. Check to see if the top is nice and puffy, golden brown. Let cool for at least 15 minutes. It’s good at room temperature too. Serve with a salad or as part of a meal. Makes a great snack. All in all, it was a great visit and a good lunch. Hope you have a go and tell me how it turns out for you and what changes you made. Thank you for reading and please leave a comment…at least tell me what you think of my new site! Salaam.I made this last night for my husband’s birthday dinner.Everyone liked it.Thank You ! Wasalam! I am so glad everyone enjoyed it. Sadia…is your husband Ahsan by any chance?? The one who is big fan of yours cooking is….??? my husband Ahsan. Come and see me and I will make you some! Miss you! Monday was very hot, even for my elevation. I closed up the house early in the morning to try to keep it cool. We do NOT have air conditioning! We really don’t need it. Then Monday night the temp was quite mild and I actually had to replace the down duvet with a lighter comforter. (yes, we sleep with down all year round!) The windows were wide open in our bedroom. The night was very peaceful but no customary cool breezes. It usually cools down so much at night with a little wind that one has to put on a jacket. I enjoyed having a relatively warm night, but it was nothing like the uncomfortable ones I remember growing up in Denver. Yesterday was overcast the whole day, rather cool, and it rained a little bit. I enjoyed the break from the sun. Now, today, Wednesday, we may be in for another hottish one. That means temps around 85-90 in the late afternoon. This probably all sounds ideal to somebody from Denver. The only rub is this, those cool nights slow down the garden quite a bit. I would like to try this recipe. Would you mind letting us know the name of a shop in Denver where you buy this phyllo? I used to live in Denver when I was a child but have not lived there for many, many years so I have a basic knowledge of Denver but it has changed so much since I lived there. One thing for sure, I am going to venture there for the new Ikea store as soon as I can! Me too! I cannot wait for Ikea to open. We had a huge one Houston and went there quite often. I am so glad it is finally here. As far as the phyllo pastry goes, I get mine from a shop in Aurora. That is where I get my Halal (Kosher) meat and all Arabic/Mediterranean products. like tahini, hummous, pita bread, olives etc. They also have a great produce section, very reasonable prices and a huge meat section. It’s called Arash International Market 2720 S. Parker Rd, Aurora Co 80014 (corner of Parker Rd and Yale) Look for the phyllo in the upright freezers in the back of the store. I hope you like it..it’s very good and if it passes the children test, it’s always a keeper in my house. Hope all is well with you. Is it hot up there too or is it just us here sweltering in the Denver heat? I am originally from Bosnia (grew up in Germany though) and I know that it is not that easy to make handmade phyllo dough. My mom and grandmother are so good at it, but I do not make the phyllo dough myself, I always buy some 😉 (I tried, believe me, but I’m making it too thick, and have to practice a lot to make it as it has to be haha). 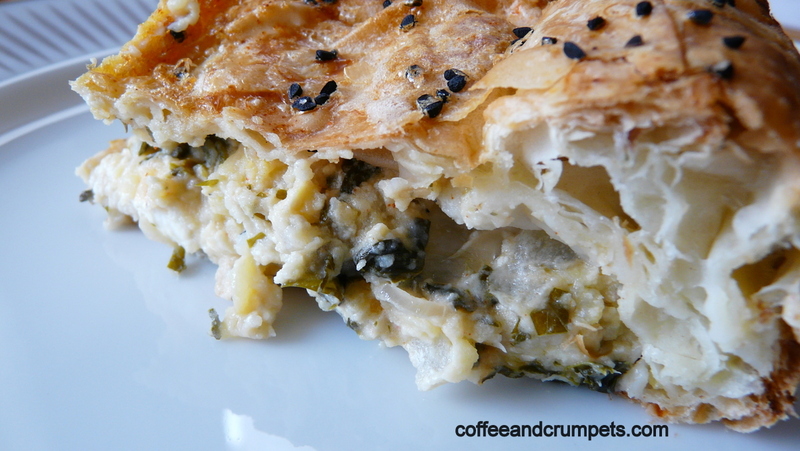 Your borek with potato, cheese and spinach looks delicious! In Bosnia you will not find borek with mashed potatoes, they are usually cut only in tiny squares, but this is a great alternative. Will try it out!